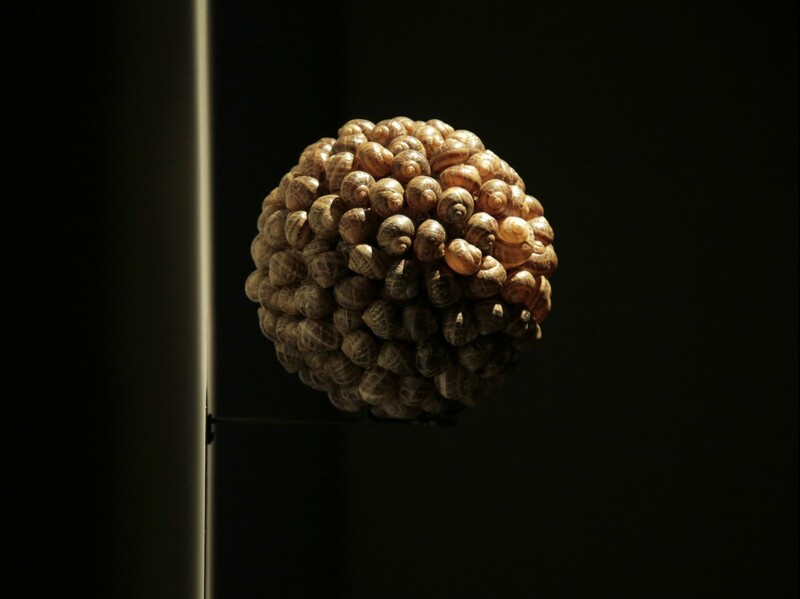 When Alice Maher wove a dense ball of briars one and a half metres in diameter, and placed it in Kilmainham jail in 1991, something important clicked and she knew it. More installation than sculpture, Cell played on memories from her Tipperary childhood as much as it engaged with the history of the space in which it was placed. It was the first work she had made for a specific location. Once in situ it took on a life of its own and marked the starting point on a path she has travelled with increasing success in the intervening fourteen since. Because personal associations are important in her work, it is tempting to see the fourteen inverted beech trees in the title installation from her latest show in the Green on Red gallery in Dublin as a chronological nod to just how far she has come. Two years after making Cell, she left her lecturing job in the National College of Art and Design to be a full-time artist. The following year she represented Ireland at the Sao Paolo Bienal in Brazil; two years after that she became a member of Aosdana, the elite group of artists elected by their peers. As far as Ireland — or at least its arts pool—was concerned, she had made it. Since then the Dublin-based artist has been building her reputation here and abroad. In recent years there has been a growing sense she may be on the cusp of even bigger things, a sense compounded by the assuredness of her every move. Rood is no exception. 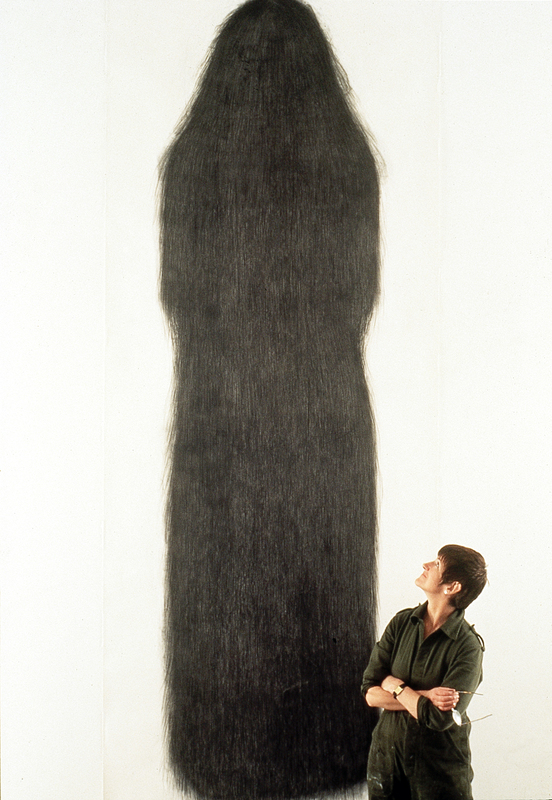 Back in the 1990s, Maher was asked what part drawing played in her practice. “I am interested in how you compose and understand space, how you walk through and around things,” she said. “That’s drawing.” It is also a perfect description of the approach she has taken to the new show, which despite the limitations of space demands a remarkable amount of walking through and around. Maher has created a mysterious indoor garden, the core element of which is Rood, a row of upside-down beech trees suspended from a steel beam in the gallery roof space. This twiggy curtain, with its coppery buds, takes its name from the elaborately carved rood screens once used in medieval churches to separate the altar space from that of the congregation. At the Green on Red it acts like a transpar­ent veil that cuts the gallery in two. Around it, Maher has placed works on plinths like garden sculptures: to the right, four spheres of clustered snail shells; to the left, a conjoined pair of bronze busts called Double Venus. Maher is something of a hoarder. Speaking of the signifi­cance of 1991’s Cell, for example, she has emphasised the lead up to its creation, the act of returning every weekend to Tipperary to gather the thorny stems, of adding extra briars found around the prison, of the way in which time spent gathering the thorns and twining the ball was an unseen but intrinsic part of the finished object. 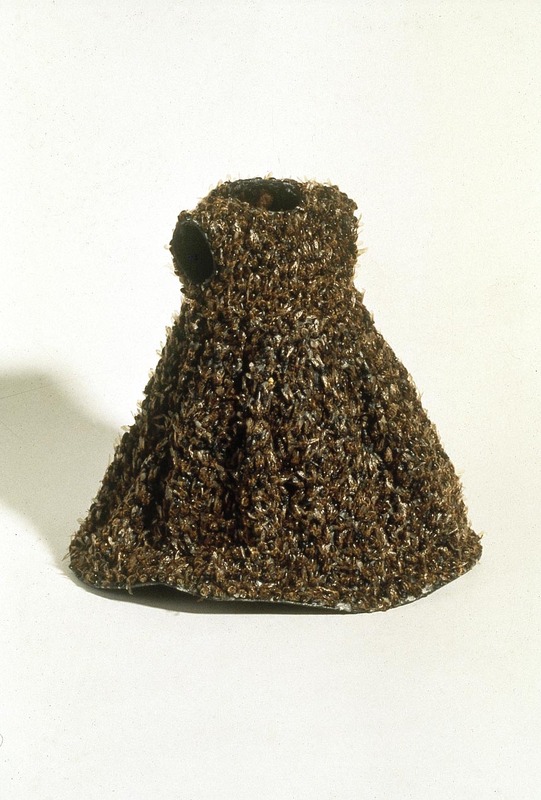 Since then she has gathered bees, rosehips and nettles for her iconic Bee Dress, Berry Dress (both 1994) and Nettle Coat (1995). This time she has been collecting brown garden snails and massing their shells into perfect spheres of fragile husks. One reason for Maher’s growing success may be that her work taps into the yearning so many Irish city and suburban dwellers have for their rural roots, be they childhood origins such as Maher’s or more distant ancestral pasts. Born in 1956, she is part of a generation of Irish women artists, including Dorothy Cross, Kathy Prendergast, Frances Hegarty and Maud Cotter, who mine memories of their youth and have innovative attitudes to their chosen media. Maher is one of the best. With her there is always more going on than appears. The associations build in layers: her brown snail shells are not only those accidentally crushed underfoot on Irish garden paths, but also the kind served at French dinner tables. Collectively called the Four Directions, these escargot spheres seem to offer some kind of geographical reference point, like miniature globes. They could be playthings or fetishistic objects. 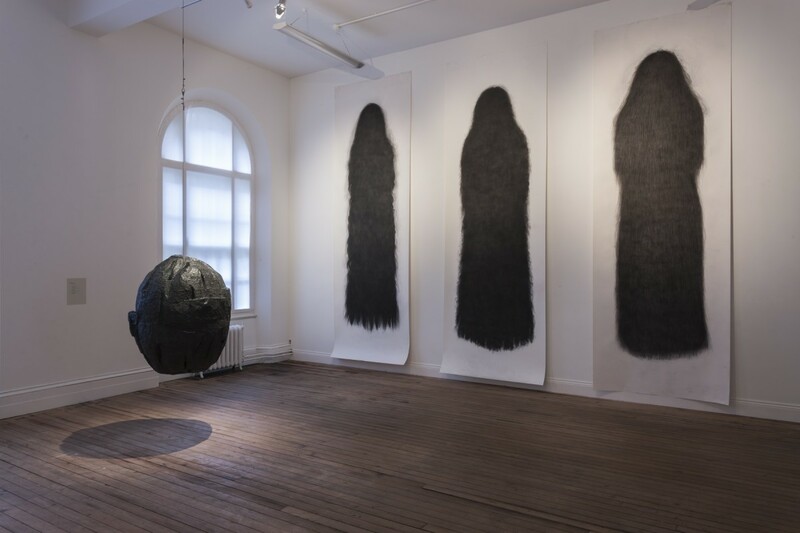 Maher may mine personal experience for inspiration, but her installations are intended to open doorways to unantici­pated associations in the viewers’ minds, to suggest a men­tal, emotional or psychological connection for those who wish to make a journey through her personal wonderland. Her interest in folklore and tradition means Rood’s branches are no random choice. Eight years ago she showed a floor-mounted row of miniature oaks with polysilk leaves at Green on Red. She updates Hedge of Experience, offering a feminine counterpoint, a glorious Beech Queen for the oddly fake Oak King. As a material, beech also has links with the snail shells: both offer shelter and a source of food (beechnuts are sometimes ground as a coffee substitute in France). A recurring seesaw between attraction and repulsion is also key to Maher’s fascination with snails. Apart from their shells, she has been looking at the slimy trails they leave, the paths they lay for themselves as protection and to facilitate safe travel. Here, Maher treats these silvery paths like paint, covering the gallery windows with digital snail-trail prints on trans­parent vinyl. A green tracery of slime bathes the room in dappled light like camouflage netting at an army jungle camp, casting an aura of leafy protection, as well as a whiff of danger, on to Maher’s secret garden. A series of prints has also been overlaid with uninhibited snail path scrawls. Fairy tales provide constant points of reference in Maher’s work, but she knows the tales that endure are those with a dark underbelly. Last year, the Irish Museum of Modem Art (lMMA) bought her 2003 The Axe (and the Waving Girl) for its collection. Maher may open her latest show with a princess and the pea-style ladder in the gallery foyer, but as is so often the case with her, it is the figure of a small girl who guides viewers through the show, although many might miss her. 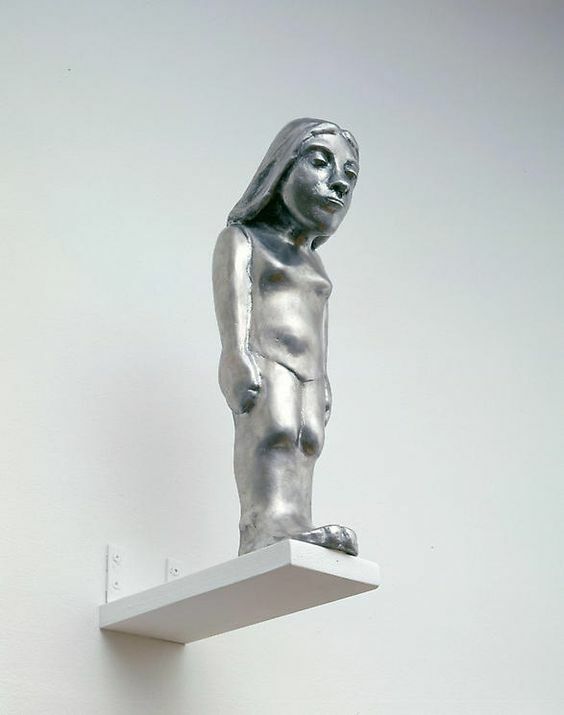 The Diver, a clear sister of IMMA’s tiny silver Waving Girl, is poised on a window ledge 6ft above eye level. Twelve centimetres tall and cast in aluminium, The Diver’s stiff arms echo those of the Irish dancers Maher was drawing and painting in 1992. Her jutting chin carries a mixture of uncertainty and self-absorbed determination. She is naked, braced for impact, and appears about to leap into the gallery below. There is anticipation here, a sense of momentum held in check, a kind of captured energy and that narrative open-­endedness with which Maher loves to play. Her engagement with the architectural environment of Green on Red and the interaction encouraged by these new works are the hooks upon which the success of the show hangs. There is nothing here to match the iconic impact of her 14ft Ombre charcoal drawing or her Berry Dress, but Rood is compelling and, for those who have been following the Maher fairy tale, an unmissable turn of the page.